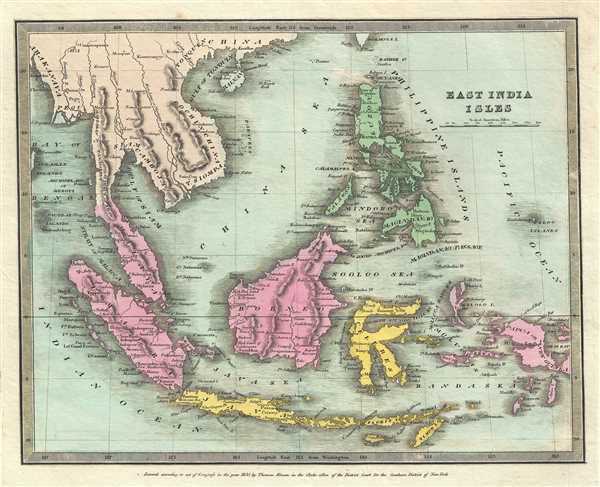 Appealing map of the East Indies and Southeast Asia. This appealing 1835 first edition map of the East Indies and Southeast Asia was issued by David H. Burr. It covers from Assam and Burma (Myanmar) south as far as Timor and from the Nicobar Islands eastward as far as the Philippines and New Guinea. It includes the entire Malay Peninsula, much of Southeast Asia (Thailand, Cambodia, Laos and Vietnam), and the East India islands of Sumatra, Java, Borneo and the Philippines. Important cities, rivers, islands, mountains and a host of other topographical features are noted. Political and regional territories are color-coded. Rumsey 4628.025. Philips (Atlases) 771.